Rosetta Stone found (1799) - After Napoleon Bonaparte rose to power in France, he launched a campaign into Syria and Egypt in 1798, in an attempt to expand French trade in Asia and cut off England's access to India. At the time, Egypt was still controlled by the Ottoman Empire but was too weak to offer much resistance (although it did try). Napoleon's top goal was to takeover Egypt and establish a double port, one on the Mediterranean and one on the Red Sea (this was before the Suez Canal was built). He failed. He ultimately was kicked out, not by the Ottomans, but by the British. However, one of the lasting legacies of expedition was the discovery of the Rosetta Stone (see the Rosetta Stone icon back on the Ptolemaic timeline). 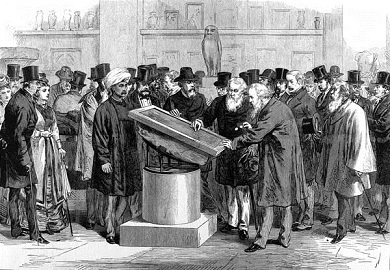 The Rosetta Stone would eventually lead to the unlocking of Egyptian hieroglyphs as a readable language, which, in turn, would open up Egyptian history to the modern world.